Ormsby, Margaret A.. "Sir James Douglas". The Canadian Encyclopedia, 13 June 2018, Historica Canada. https://www.thecanadianencyclopedia.ca/en/article/sir-james-douglas. Accessed 18 April 2019. James Douglas was the son of John Douglas, a Scottish merchant of cotton and sugar who owned a plantation in Demerara, a Dutch colony in present-day Guyana. The Douglas family was well-established in Scotland, and John was descended from the earls of Angus. John’s brother, Lieutenant-General Sir Neil Douglas, became Commander-in-Chief for Scotland in 1842. James Douglas’s mother was Martha Ann Ritchie, a free woman of colour who had been born in Barbados. The term coloured generally referred to a person of mixed race who was of African and European ancestry. The description that she was free indicates that she was not enslaved (see also Black Enslavement in Canada). Martha Ann was the daughter of a free woman of colour, Rebecca. In the 1790s, mother and daughter moved to what is now Guyana in search of better economic opportunities. Rebecca eventually became a hotelier and boarding-house keeper outside of Georgetown and owned 30 slaves. Martha Ann met John Douglas while he was on plantation business, and they had three children together, though they never married. John Douglas returned to Scotland, where he married in 1809 and started a second family. In 1812, when James Douglas was 11 years old, his father sent him and his brother, Alexander, to Lanark, Scotland, for schooling. James never returned to Demerara or saw his mother again. In 1819, when he was 15, Douglas was apprenticed to the North West Company (NWC), a major force in the fur trade, and sailed to Montreal. He spent his first years working in the counting houses of Fort William (in present-day Ontario) and Île-à-la-Crosse (Saskatchewan), learning the fur trade and its accounting practices. 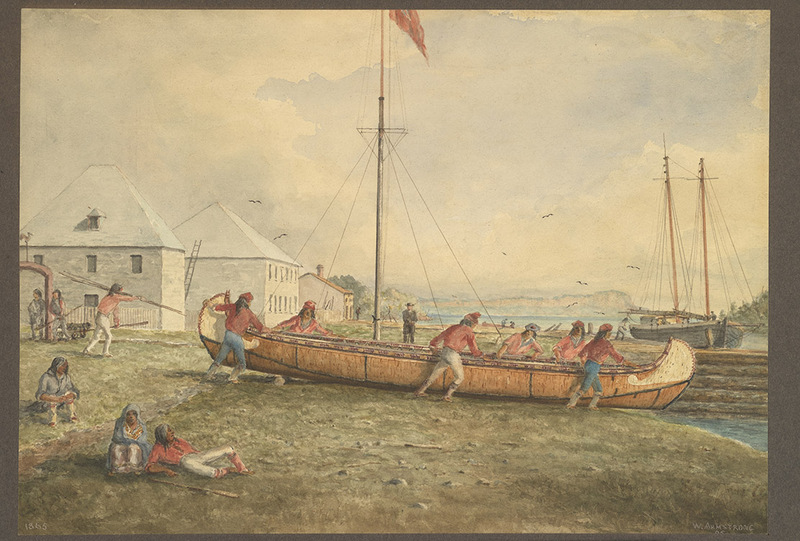 The Hudson's Bay Co post on Lake Superior, 1857, in a watercolour by William Napier (courtesy Library and Archives Canada). 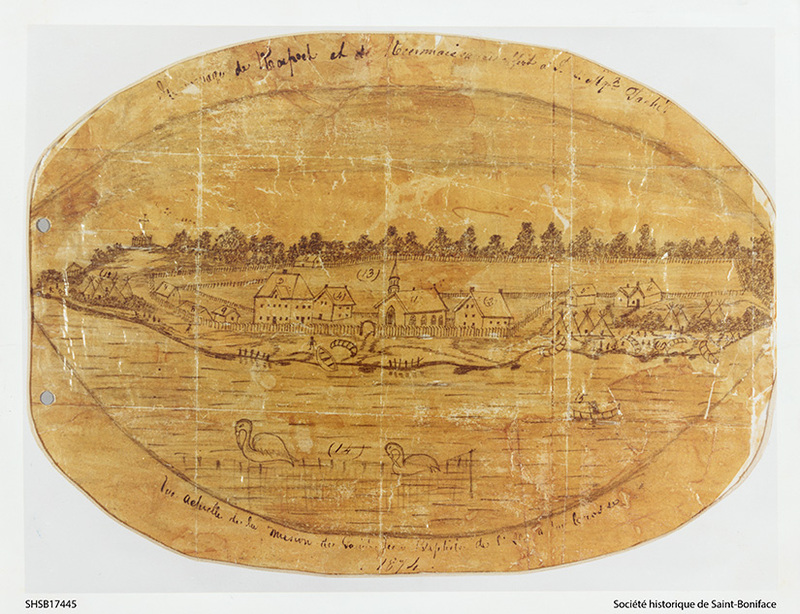 Copy of a sketch by Sara Riel of the Catholic mission at Île-à-la-Crosse (1874). At the time, intense competition between the North West Company and the Hudson’s Bay Company (HBC) escalated from economic conflict to occasional physical violence (see Battle of Seven Oaks). The teenage Douglas was soon drawn into the fray. In late 1820, Douglas fought a bloodless duel with Patrick Cunningham, an HBC guide, and in April 1821, he was one of four Nor’Westers the HBC warned not to parade within gunshot of Fort Superior with “Guns, Swords, Flags, Drums, Fifes, etc., etc.” Months later, Douglas became an employee of the HBC, after it merged with the NWC. George Simpson, governor of Rupert’s Land, who met Douglas at Fort St. James in 1828, described him as “a stout, powerful active man of good conduct and respectable abilities.” However, Simpson also mentioned that Douglas became “furiously violent when aroused,” a tendency that brought him into conflicts with the Dakelh (Carrier) peoples. In 1830, Connolly recommended that Douglas be transferred to Fort Vancouver due to his weakened relationship with the Dakelh. At Fort Vancouver, he served under Chief Factor John McLoughlin and was later promoted to chief trader (1835) and chief factor (1839). McLoughlin was superintendant of the Columbia District of the fur trade for two decades. In 1840, Douglas travelled to Alaska to negotiate boundary and trade deals with the Russian American Company. 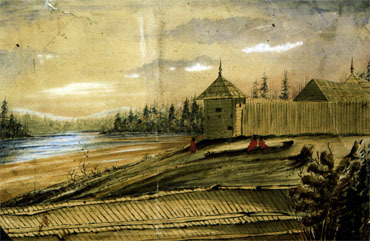 In 1843, as American influence on the Pacific Northwest increased, Douglas began constructing Fort Victoria on the southern tip of Vancouver Island to replace the northern coastal forts. In 1846, the Oregon Treaty established the forty-ninth parallel as the border between the United States and British North America in the West, leading HBC to withdraw from Fort Vancouver. That same year, Douglas established a new fur brigade on British territory, from New Caledonia to Fort Langley on the lower Fraser River. Fort Victoria, where the furs from the interior were transshipped, became HBC’s main Pacific depot in 1849. In order to prevent American expansion northward, on 13 January 1849, Vancouver Island was declared a Crown colony and was leased to HBC for 10 years. Douglas, the supervisor of the fur trade since 1845, was appointed HBC agent on the island. However, the British government selected barrister Richard Blanshard for governor. Blanshard arrived at Fort Victoria in March 1850 to find his residence not completed. He soon learned that HBC had virtual control of the colony’s affairs, that most British colonists were associated in some way with the company and that power ultimately rested with Douglas, the chief factor. Blanchard resigned and departed Vancouver Island in August 1851. On 30 October, Douglas learned he had been chosen as governor. His worries were great. He was often criticized for a conflict of interest between his duties as governor and as HBC chief factor and for the appointments he made to key positions in the colony. According to Douglas, qualified men were in such short supply that he appointed his own brother-in-law, newly arrived from Demerara, as chief justice of the Supreme Court. In 1856, Douglas was instructed by the Colonial Office to establish an elected legislative assembly for the island (see Responsible Government). He was opposed to universal suffrage and believed that people really wanted “the ruling classes” to make their decisions. Because of this, Douglas set property qualifications for the right to vote and for membership in the assembly that were so high, only a few landowners qualified. From 1850 to 1854, Douglas negotiated 14 land purchases with First Nations on Vancouver Island, including land in and around Fort Victoria, Fort Rupert and Nanaimo. These are known as the Douglas Treaties or Fort Victoria Treaties (see Treaties with Indigenous Peoples in Canada). In each, lands were purchased in exchange for small amounts of cash, clothing, blankets, occupation of reserved lands, and hunting and fishing rights on unoccupied ceded lands. These treaties have long been disputed for several reasons, including the fact that the terms of the agreements were left blank at the time of signing, with the clauses inserted at a later date. According to Indigenous oral history, many of the signatories assumed they were signing a peace treaty — assuming the X they were asked to sign was the symbol of the Christian cross, which they perceived as a spiritual gesture. Others assumed the agreements were a confirmation of their agricultural lands and village sites. On Sunday 25 April 1858, a boatload of boisterous miners from California — the first wave of 25,000 newcomers — arrived in Victoria on their way to search for gold on the Fraser River sandbars (see Fraser River Gold Rush). To that point, Vancouver Island and mainland British Columbia were sparsely populated by European settlers. About 500 settlers lived on Vancouver Island and about 150 on the mainland. Concerned at the arrival of so many Americans, Douglas wrote to London: “If the majority of immigrants be American, there will always be a hankering in their minds after annexation to the United States.… They will never cordially submit to English rule, nor possess the loyal feelings of British subjects” (see also Manifest Destiny).Douglas took the precaution of claiming the land and the minerals for the Crown. He also distributed licenses to the miners and, to stem an invasion, stopped foreign vessels entering the river. For this action, which seemed designed to protect the HBC monopoly, he was reprimanded by the Colonial Office. In search of immigrants who might be sympathetic to Britain, Douglas reached out to members of the San Francisco Black community, who had been discussing the need to emigrate to a more welcoming environment. In 1857, a United States Supreme Court decision had denied citizenship to both free and enslaved African Americans. Douglas promised them British citizenship after five years of land ownership and full protection of the law in the meantime. The community established a 35-member “pioneer committee” to investigate the offer, meeting a “very cheerful and agreeable” Douglas in Victoria on 25 April 1858. Not long after, several hundred Black families moved to the colony (see Black History in Canada). In November 1858, no longer a fur trader, and the rights of his old company west of the mountains having been extinguished, Douglas, who was still governor of Vancouver Island, was inaugurated at Fort Langley as governor of British Columbia. He was also appointed Companion of the Order of the Bath, in recognition of his administration of Vancouver Island. 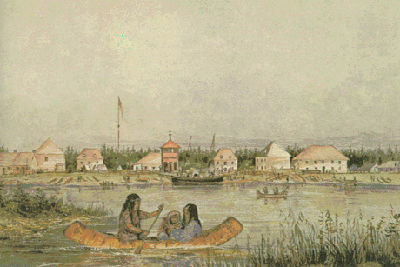 Douglas expected that a location near Fort Langley would be chosen for the colony’s capital. 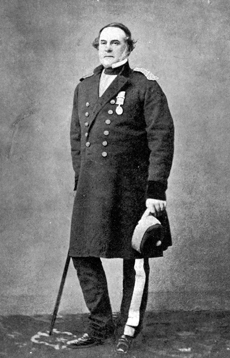 But for military reasons, Colonel Richard Clement Moody in January 1859 selected a steep, heavily timbered site (New Westminster) on the north bank of the Fraser River. Douglas was concerned about the cost involved in laying it out. He also preferred Victoria as an administrative centre and as his place of residence. His visits to New Westminster were rare, and despite the grant of municipal self-government in 1860, the citizens of British Columbia demanded a resident governor and political reform. 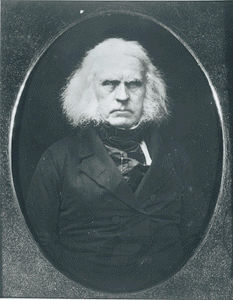 As governor of British Columbia, Douglas was chiefly concerned with the welfare of miners. He relied on his gold commissioners to lay out reserves for Indigenous peoples and thus eliminate the threat of warfare, to record mining and land claims, and to adjudicate mining disputes. For the gold colony, he devised a land policy that included mineral rights. 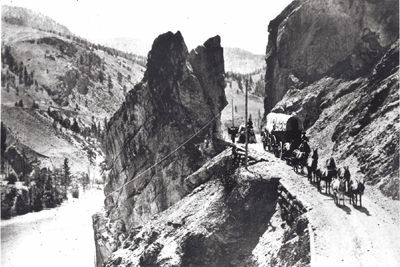 By 1862, he was planning to finance by loans (about which London was not fully informed) a wagon road 640 km long following the Fraser River to distant Cariboo, where gold nuggets had been found (see Cariboo Road). It was extended in 1865 to Barkerville, a booming mining community (see Cariboo Gold Rush). Beginning in 1860, the citizens of British Columbia made several petitions to Douglas for a form of popular government in the colony. Dissatisfied with his response, they directly petitioned the Colonial Office in London in 1863. It seemed an opportune time to retire Douglas as governor of both Vancouver Island and British Columbia, and he left the following year. Douglas was praised for his work and talents and invested as a Knight Commander of the Order of the Bath, which earned him the title Sir. Douglas toured Europe in retirement before returning to Victoria, where he died of a heart attack on 2 August 1877. Sir James DouglasA brief profile of Sir James Douglas, governor of British Columbia, from The Afro News website. Sir James DouglasA biography of Sir James Douglas, HBC officer and governor of Vancouver Island and of the crown colony of British Columbia. From the Dictionary of Canadian Biography Online.